You may love running a multi-author site, but even on WordPress it has its challenges. WordPress tools can help you manage your multi-author site and make your site more interactive by adding features that make using it a more rewarding and satisfying experience not only for you and your readers, but for your authors, as well. WP Status Notifier: This plugin notifies the Contributor author, via e-mail, when his post is published to (or rejected by) your site. Editorial Calendar: This plugin gives you an overview of scheduled posts, post authors, and the dates when you scheduled the posts to publish to your blog. This plugin can help you prevent multiple author posts from publishing too close together or, in some cases, right on top of one another by enabling you to reschedule posts by using a drag-and-drop interface. Email Users: This plugin allows you to send e-mails out to all registered users of your blog, and users can send e-mails back and forth to one another by using the plugin interface in the Dashboard. 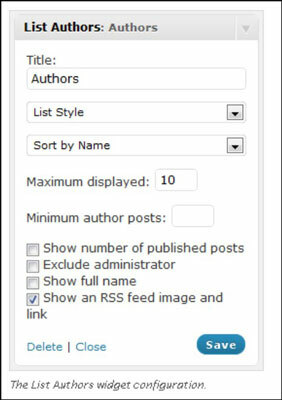 Subscribe to Authors Post Feed: This plugin adds an RSS feed to each author’s post archives, which allows you, other users, and site visitors to subscribe to that author’s RSS feed so that you receive immediate notification through your RSS feed reader when the author publishes new content. Dashboard Notepad: This plugin gives you a widget that appears on your main Dashboard page and allows you and other users to leave notes for each other. Author Information Widget: This plugin gives you a widget that displays the post author’s name, biography, Avatar, and Social Network and Contact links. List Authors: This plugin provides a widget that displays a list of the authors on your site, where the author’s name is a link to her post archive. Profile Pic: This plugin gives your authors the ability to add their own photos to their profiles on your site, and it provides you with a widget that can display each author’s photo. Author Spotlight: This plugin provides a widget that you can place in your sidebar, displaying the profile of the author of the post being viewed. Author Based Twitter: This plugin gives your authors the ability to show their own Twitter feeds in the sidebar by using a handy widget. Co-Authors Plus: This plugin allows you to assign multiple authors to one post, which you may find especially helpful when you have more than one author collaborating on an article. Author Complete Post List: This plugin provides an easy way to show a complete list of an author’s posts, enabling you to display an archive page per author. Custom Author Byline: This plugin adds a custom author byline module below the Post Editor on the Add New Posts page, which enables you to include the name of an author who’s not a registered member of your site. Pending Post Notifier: This plugin simply sends an e-mail to the site administrator whenever posts are ready for review. Audit Trail: This plugin records the actions of the registered users on your site, such as when they log in or log out, when they publish posts and pages, and when they visit pages within your site.